I had the opportunity to take my son to Karate Camp this past weekend, a two-day event that gathered about 25-30 members of his studio to work on different forms, study new techniques, perform a test for the next belt level and do some overall group bonding. This was the first time he or I had attended something like this, so I wasn’t really sure what to expect. By the end though, I was inspired to study my guitar even more. 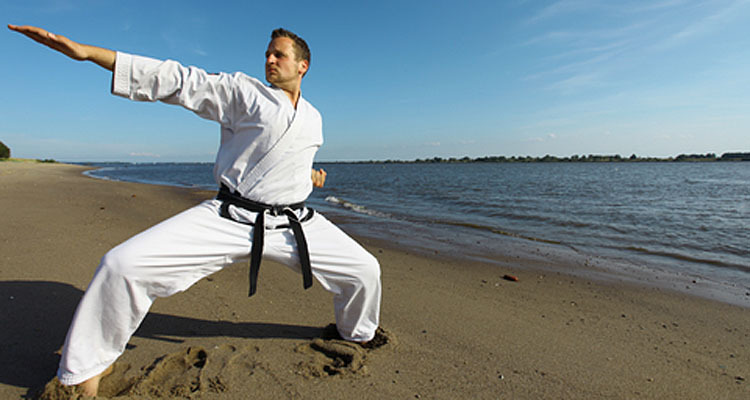 Upon arrival to Karate Camp, we were welcomed with open arms by a wide range of individuals — young & old, short & tall, thin & wide, male & female, white & black — but all there for a common interest: karate. You could immediately feel the passion they all had for this commonality between them. And, since the purpose for being there was to connect and to learn, the varying skill levels between the people there was irrelevant. In short, there were no egos. The love of their craft bonded them. As the day progressed and it became clear who were more advanced in martial arts — the black belts vs. the green belts vs. the orange belts vs. the white belts — another thing struck me… the experience levels had nothing to do with those other defining characteristics. One’s age didn’t matter. One’s gender didn’t matter. One’s race or background didn’t matter. One’s physical size didn’t matter. There were black belts in their teens… and there were white belts in their 40s. Age certainly didn’t mean anything. There were boys who were brown belts… and there were women who were green belts. Gender certainly didn’t mean anything. There were white guys who were students … and there were Indian girls who were the instructors. Race and background certainly didn’t mean anything. The only factor that came in to play was one’s knowledge of their art and their ability to demonstrate their abilities. As a grown-up guitarist, especially one who is just starting their journey, a common question that seems to pop in our heads is “Am I too old?” Well, age didn’t matter at karate camp, and it certainly doesn’t matter for learning how to play the guitar. In the end, what it all comes down to is how much study you put in to your craft and how well you can perform. This message speaks to the heart and soul of what grownupguitarist.com is all about. It is the reason I’m sharing my journey here and the reason I look for your suggestions and feedback. We all have a common interest: guitar. My vision for this site is to not only invite you in to my world, but to create a community where we can leave any egos at the door and share our passion for music and playing guitar. Whether it be karate, or music, or life, we always have an opportunity to learn from those around us. Age does not equate experience. And size, gender, race, color, etc., etc., etc., does not affect one’s ability to learn and grow. Stay focused. Stay committed. And just keep putting one foot in front of the other as you walk the path towards greatness.